Along with most other people I have pretty much forgotten about inscription this expansion. This is a huge opportunity that I have missed for the most part. A conversation on the woweconomy discord a couple of days ago sparked my interest in inscription (mostly based on the trinkets and tomes). The profit margin people were talking about indicates that the market has been primarily forgotten.If you’re not already on the discord server I strongly recommend it because it has some really good conversations about gold-making. I will dive heavily back into this, I already started leveling my lvl 100 scribe. I have been doing all the minor glyphs in the game from before Legion for a while. And I thought I would write out how you can get into those as well. As we can see from the TSM summary for my glyph group I’ve made a good bit of money since Legion. There has generally been a view that glyphs are not that good for money-making as the competition is too high and you have to baby-sit and repost to make sales. I repost once a day, and my average sales are 1500g per day. First lets look at the requirements. Obviously you need a character with inscription. The highest level glyphs need skill level 500 and are based on Ink of Dreams. To level up inscription the easiest way is to get cerulean pigment from milling WoD Herbs and crafting Warbinder’s Ink and then the research scroll. You will have to research glyphs anyway so it is not wasted. WoD herbs are generally quite cheap, so this should not be to expensive. Research: Warbinder’s Ink is the research spell you learn with Draenor Inscription. It is available at skill level 1 and can be spammed. Just crafting this one until you have all the recipes is by far the easiest way to get them all. Why are pre-Legion glyphs good? Before Legion launched I crafted up 120 of each glyph while herb prices were really low. My average crafting cost was about 15 gold. As we see from the summary I have been making a good bit of money from glyphs while only posting once a day. You can see a summary of my top selling glyphs here. 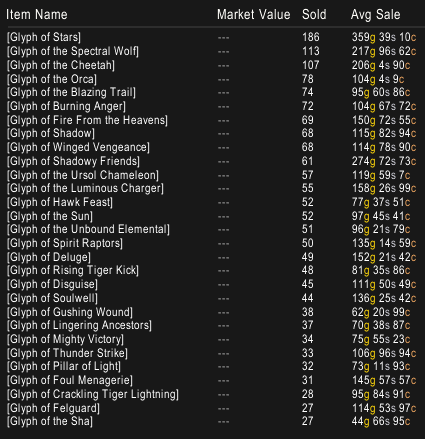 Glyph of Stars in particular is selling at a ridiculous rate. Comparing the average prices to my 15 gold crafting cost is also quite nice reading. Profit margins are 200% and above for the best sellers, which is pretty amazing. Crafting glyphs is an operation that can take quite a while. Getting all the appropriate materials and stocking up is generally tedious. I strongly suggest using TSM with crafting and restocking operations and using the gather function for getting inks. You can usually get some old world inks quite cheap, so this will increase your profit. If you are unfamiliar with TSM crafting you can check out Phat Lewts video guide on it. If you are lazy and want a more easy setup I would suggest changing the price source for all inks to 1 roseate pigment. You can then just mill Legion herbs and trade, and all crafting cost based operations will still work. This approach is only viable if you have a use for Sallow Pigments, but there are tons of good candidates here, so that shouldn’t be an issue (Hi Tome of the Tranquil Mind). This sets the value to the market value of Roseate pigment. If you dont value Roseate pigments or you plan to mill the low level herbs then you can just ignore all this and keep the default crafting value. I also use a crafting operation for restocking glyphs. I set the minimum restock to 10 glyphs and I stock up to 20 of each. 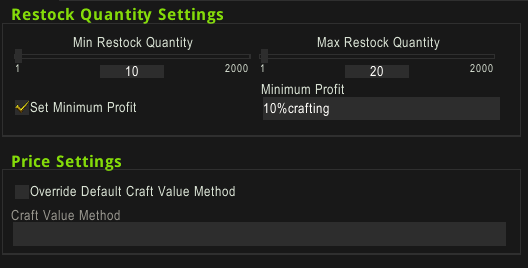 I set the minimum profit to 10% crafting. All of my TSM settings are included in the pastebin linked in the title. 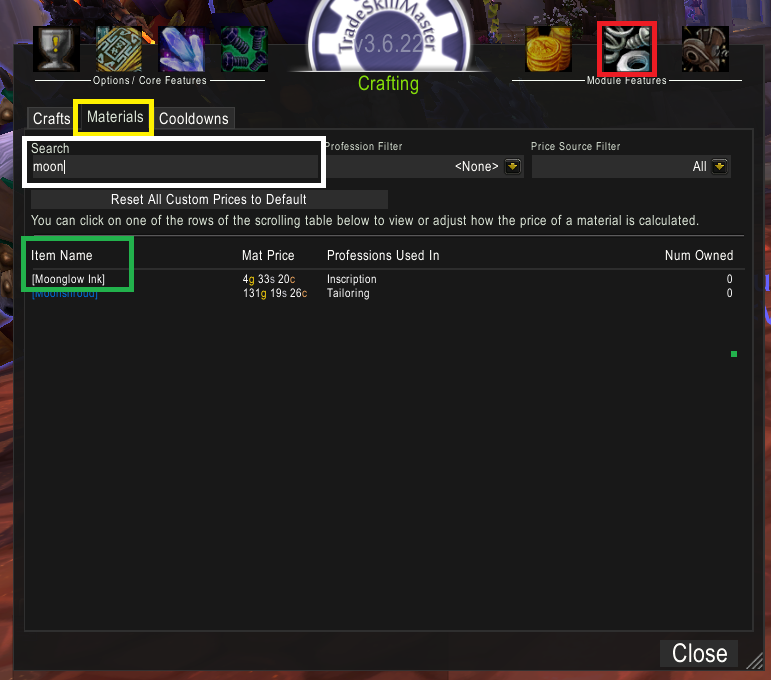 If you need help importing TSM groups just my second post on jewelcrafting includes a description on how to do it. As alway please direct any questions you have to me in the comments, on twitter or on discord. You can find me on my own discord, where I have a channel for spreadsheet support or on the woweconomy one. I also infrequently stream on twitch, so please follow me there if you want to have a chat about gold-making and watch me in action!